Content of metals and nitrogen are increased in the vicinity of major cities, industrial and thermal-energy centers. Increased values in western Slovenia are the result of remote transport, in northeastern Slovenia mainly due to transport and agriculture. In 2006, the nitrogen concentration were highest in Slovenia (among all the participating countries in project). Datebase of The Jožef Stefan Institute, 2009. 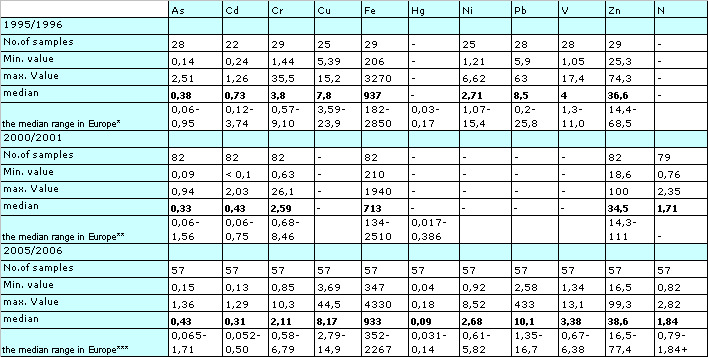 Figure ZD10-3: Meduim value (median) of arsenic, cadmium, chromium, copper, iron, mercury, nickel, lead, vanadium and zinc (in mg/g dry matter) and nitrogen (% of dry matter moss) in the moss species Hypnum cupressiforme earned on intersection of 16 x 16 km grid in Slovenia, 1996-2006, and comparison with other European countries (the area median).